Were there two Roman Senates at the same time? Chris asks if the Roman Senate moved with the capital to Constantinople. Constantine wanted his city to copy Rome in nearly every respect. Rome had 7 hills so Constantinople would too- even if it took some creative counting to reach seven on the Bosporus. He naturally intended for a Senate as well- not to replace the Roman one but to mirror it. But despite Constantine’s best effort, Constantinople’s version of the Senate was much less respected and originally functioned as a kind of city magistrate. As the importance of the city grew so did its Senate’s prestige. 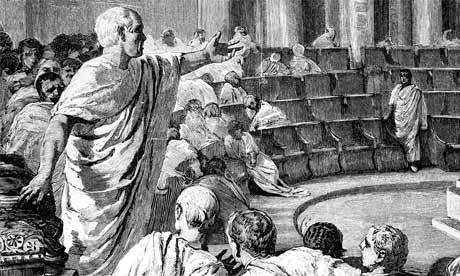 In the East, the Senate remained as a functioning body until the 13th century. Their last recorded act was raising the unfortunate Nicholaus Kanabus as emperor during the 4th Crusade. Their power had been declining for centuries (as detailed here) and their titles were empty, but there were Senators defending Constantinople’s walls on the morning of May 29, 1453.